Bella is an outstanding bay-black animal. 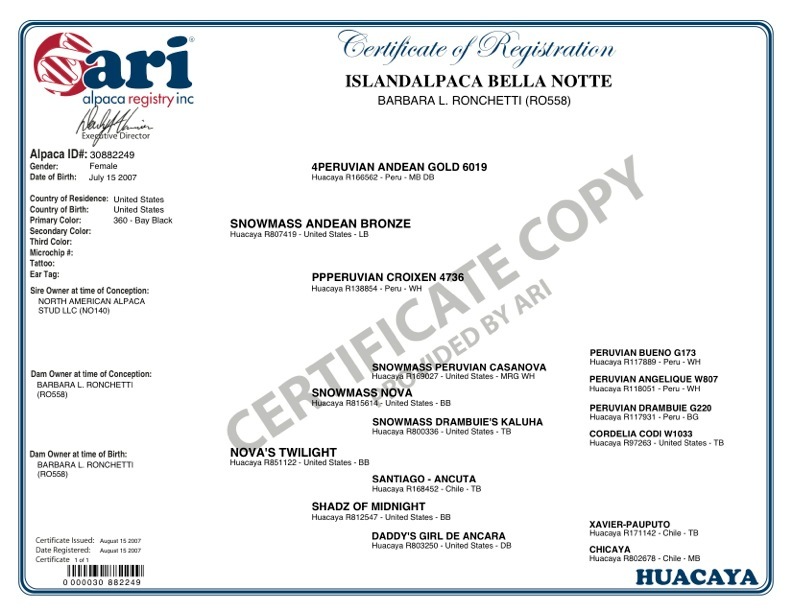 Her sire the notable Snowmass Andean Bronze and her dam Nova's Twilight has gifted her her upright stance and undeniable presence. 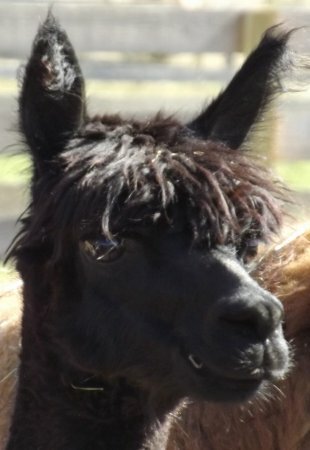 Andean Bronze is that exceptional dark colored alpaca whose fiber is like velvet. With a four year histogram of 20.5, 4.0, 19.6, 2.0, he has fiber stats that surpass the vast majority of his light colored brethren. He has shown the ability to consistently pass those attributes onto his offspring, such as Bella, who have been a dominant force on the show circuit for a while now. 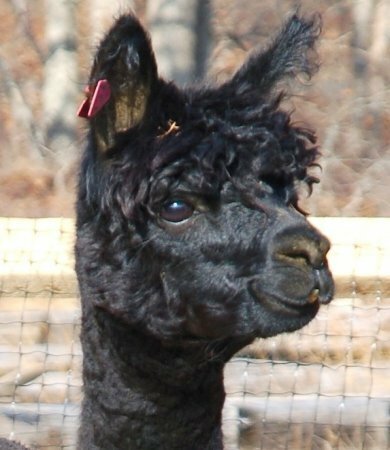 The premier brown Herd Sire of the North American Alpaca Stud with very good reason. 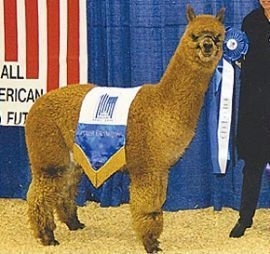 Bella's son Estrada's Bosco won a blue at the competitive North American Alpaca Show in 2013 out of eight other alpaca. Very impressive! Bella's fineness combined with CT Estrada's density, created this amazing male. 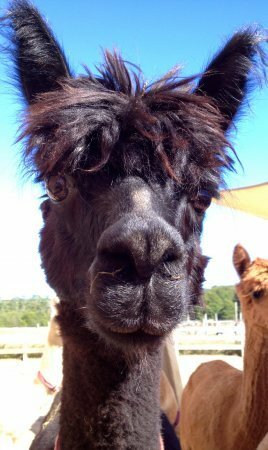 Bella will be a terrific addition to any herd with her curious and nurturing disposition and her amazing conformation and fine fleece. She's very easy to handle and is a fantastic mother. 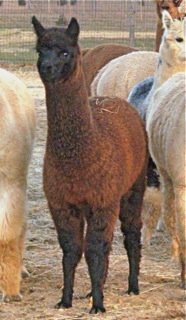 Andean Bronze is that exceptional dark colored alpaca whose fiber is like velvet. With a four year histogram of 20.5, 4.0, 19.6, 2.0, he has fiber stats that surpass many of his light colored brethren. He has shown the ability to consistently pass those attributes onto his offspring who have been a dominant force on the show circuit for a while now. 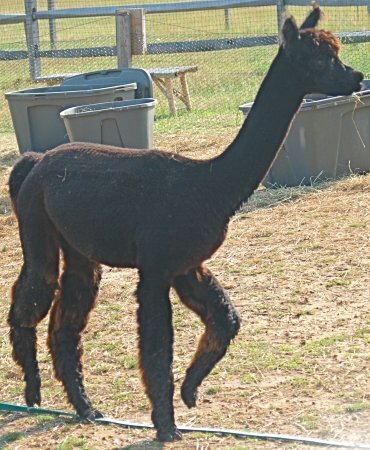 The premier brown Herdsire of the North American Alpaca Stud with very good reason!